Iceberg in Iceberg Alley during an Iceberg Watching Tour with Northland Discovery Boat Tours who operate out of St Anthony, Viking Trail, Great Northern Peninsula, Northern Peninsula, Newfoundland, Canada. The icebergs seen off the coast of Newfoundland originate from the ancient Glaciers of Greenland. The Glaciers in Greenland calve into the sea making a thunderous noise, from here they begin their 2-3 year journey. They first head north on the currents into Baffin Bay and spend their first winter in the bay. Once the pack ice melts and releases the icebergs, the currents then bring them through the Davis Strait towards the Labrador Sea and northern coast of Labrador where they spend another winter trapped in pack ice. They are released once again when the pack ice melts and finally make their way south along the Labrador Coast then past the coast of Newfoundland. Some get trapped in the Gulf of St Lawrence while others cruise the coastline towards the Avalon Peninsula. One iceberg was recorded to have travelled as far as the Bermuda Islands. 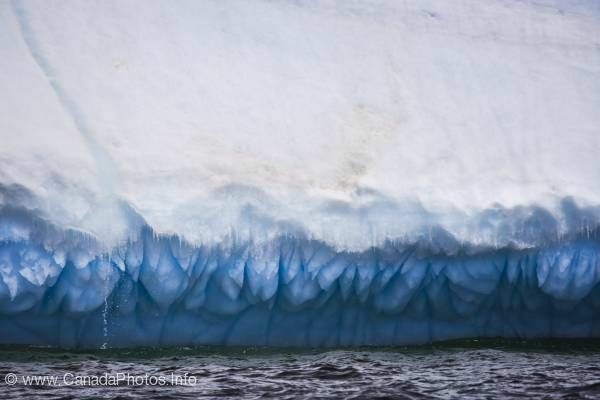 These large bergs will take approximately 2 months to melt from the time they are viewed on the iceberg watching tour. The ice in these icebergs is between 10,000 to 15,000 years old.